From death to Immortality lead me. 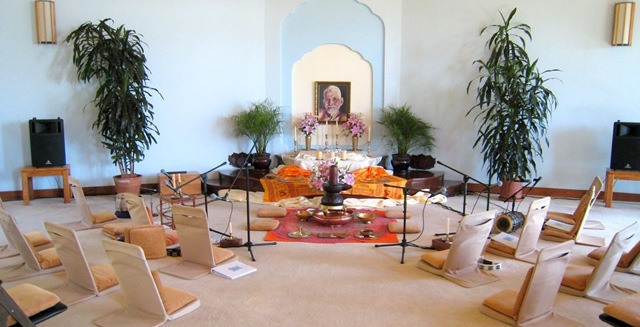 All set-up, awaiting Dipavali celebration at the SAT Temple. “The demon Naraka who rules hell, the notion that I am this body, where is this demon?” inquiring thus with the discus of jnana, Narayana destroys the demon; and this day is Naraka-chaturdasi. 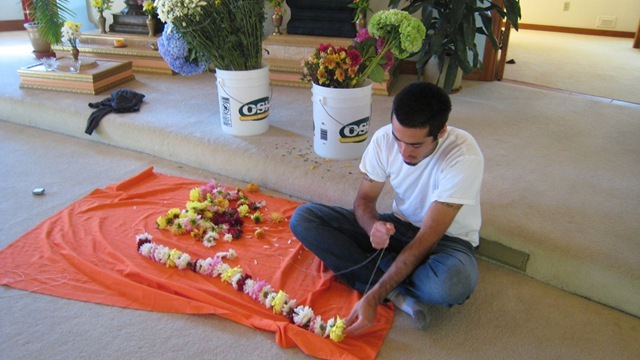 Here, Nome prepares puja offerings for the evening event . . .
. . . while Jaden prepares the malas for Ramana. 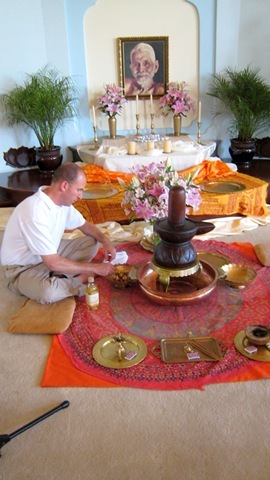 Puja is offered, while readings and kirtans accompany. 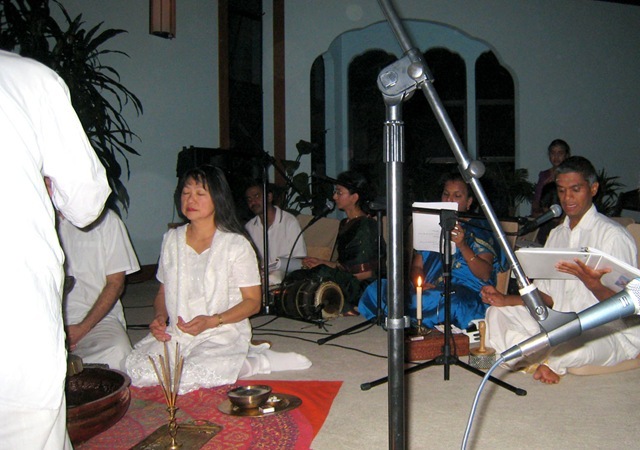 Ganesh, Dhanya, Sangeeta, and Raman lead chants during puja while Wimala and others meditate. 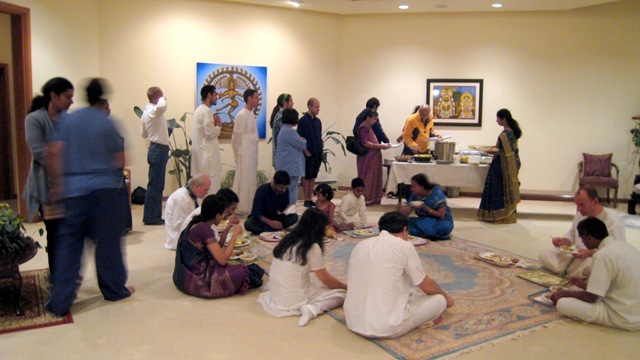 After puja, all those present share prasadam together in the Lotus Room. 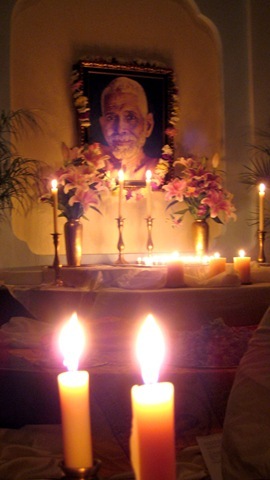 Master: What is your light? Disciple: The sun during the day, the lamp and other lights by night. Master: It may be so, but please tell me what is the light by which you see the sun and lamp. Master: When you close it or when you are not able to see through other causes? Disciple: It is the mind. 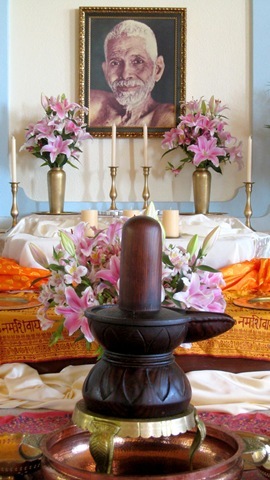 Master: And what is the light by which you see the mind, itself? Disciple: In that case, it is myself. 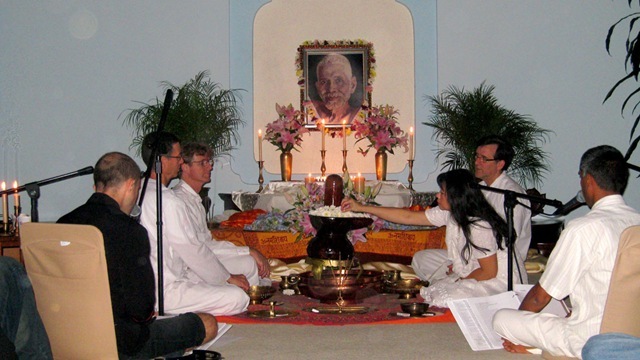 Master: So, then, you are the Supreme Light? Disciple: Yes, Master. I am That. We are very happy that you enjoyed the blog post. We hope that the teaching contained in these posts make their home in your heart and that you abide as the light of all lights.